Mortal Blitz applies Gun Shooting games from arcade game centers into VR platform, and lets you experience the whole new 1st person VR action shooter experience. In this game, the player becomes 'Yuhei' ex- F.O.R.C.E. (governmental elite soldiers), and toils and fights in the mission to thwart the evil plans of the Dominion's Teratoma Destruction Plan. 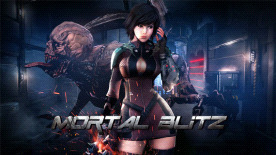 Mortal Blitz aims to provide fun and various experiences as a gun-shooting game by implementing these systems. Dual Aiming System which lets the player conquer enemies with two weapons. Training mode, which lets players practice shooting with many levels of mini-game. Groggy Finish System which lets you experience heroic and stylish battles by pulling in enemies in groggy state with slow motion and in-air shots. Copyright (c) SKONEC Entertaiment CO.,Ltd. All Rights reserved. Mortal Blitz, SKONEC and Bluecapsule Studio logo are registered trademark of SKONEC Entertaiment CO.,Ltd.